The host of PBS's Simple Wisdom and The Wisdom of Our Yearnings explores life's most defining human experiences. A perfect love, enduring happiness, discovering our purpose. Yearning for these experiences accompanies us through life, leading us to both joy and disappointment, and to a powerful vision of who we are, and who we can become. Far from being a burden, our yearnings can themselves become a path to blessing, prompting questions and insights, resulting in new ways of being and believing. 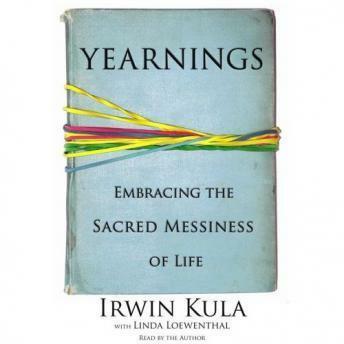 In Yearnings, renowned Rabbi Irwin Kula explores and celebrates seven of our deepest desires. He opens the spiritual toolbox of Jewish wisdom -- it has much to teach about the ambiguities and uncertainties we all encounter -- and takes us on an excursion into our age-old questions, merging ancient wisdom and stories with contemporary examples and insights. Whether it's a woman struggling with a breach in her marriage, a child wondering about the tooth fairy, or Moses yearning for answers in the story of the burning bush, Yearnings offers a broader perspective to enrich our search for meaning. The practices and insights in this book are based on teachings that have evolved for over three thousand years, as generations have wrestled with the messiness and complexities of the human experience. Rabbi Kula invites us to do the same, urging us to seek answers to our deepest questions, to search for spiritual and personal fulfillment while knowing we will never finally get there, and to celebrate the discoveries we'll make along the way.